A $65 million transformation brings the epitome of California coastal chic with incredible ocean views, waterfront dining, a contemporary poolside lounge, an eco-friendly spa, and redesigned guest rooms. The only hotel in San Diego with multiple water slides, you'll delight in three new pools, waterfront spa, and full-service marina with jet skis, sailboats and kayaks. Coupled with its premier location to Sea World, this luxurious resort has become the unparalleled choice for discerning travelers. 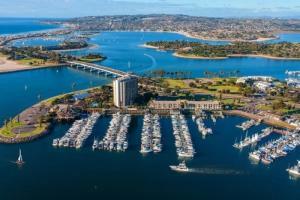 Hyatt Mission Bay Spa & Marina is eight miles from the San Diego Convention Center and San Diego's central business district. Red Marlin serves California-modern cuisine with an emphasis on sustainable, organic ingredients and boasts bayside views. The pool bar and lounge, SWIM, offers a Pan-Latino fusion menu and showcases a 360-degree, 800-gallon aquarium in the center of the bar.